It's dinnertime, and your pet is chomping at the bit. You barely get the bowl to the floor before they voraciously start eating their food way too fast. You think to yourself, "Slow down! Don't you need to breathe?!? ", but before you can intervene, your pet has basically inhaled their entire meal. For many pet owners, this is an all too familiar routine. If you are concerned that your dog eats too fast, or if you notice that your cat is regurgitating their food shortly after meals, then slow feeder bowls, or other slow feed methods, might be the perfect choice for you. Lots of dogs and cats love food, and they often gorge themselves as if food is going out of style. It may seem cute or funny, but this poor eating habit can actually cause more problems than you think! No matter the quality of food, if your pet is basically inhaling it, then it's most likely going to cause at least a few of these problems. Kibble has long been touted as the solution to dental health, but the fact is, our pets don’t chew their food properly. Most of them chomp once or twice if we’re lucky, and then down the hatch it goes. While certain types of food, take a raw diet for example, do have some dental benefits, most diet formats can actually contribute to your pet's dental issues. Food is not a dental solution and regardless of what you feed, a consistent dental routine needs to be implemented to prevent irreparable damage to your pet's health. Speed eating makes it harder for your pet to digest food and absorb nutrients. Poor digestion can lead to gas, poor stool quality, bloat and in some cases, nutrient deficiencies. The act of chewing is the first step in digestion, so any food that isn’t thoroughly chewed will put more pressure on the rest of the digestive system to break down the proteins, fats, and carbohydrates in a timely manner. A few farts may not seem that serious, but they could be your pet’s body letting you know that there is something more severe going on. Gastric Dilatation Volvulus, or Bloat as it is commonly called, can happen when your pet is gulping down large amounts of air with their food. As the stomach cavity hits maximum capacity, it can start to twist and turn, potentially blocking food from passing from the stomach to the small intestine. Bloat in dogs and cats can be quickly life-threatening and prevention is the first line of defence. For more information about this condition, check out How to Prevent Bloat in Dogs. Pet's who don't chew their food or eat too quickly are much more likely to overeat. Of course, portion control is recommended for more enthusiastic eaters, but poor digestion can also affect how satisfied your pet may feel. Begging and food stealing are more common in pets who are determined to shovel food into their faces. Even if you are lucky and they don't regurgitate the food that they've guzzled down, your pet will still be unable to use those calories efficiently. As part of a weight management program, slow feeding is highly recommended to increase your chances of success. Check out Weight Loss Dog Food: Managing Your Dog's Weight, if you want to learn more about weight management. 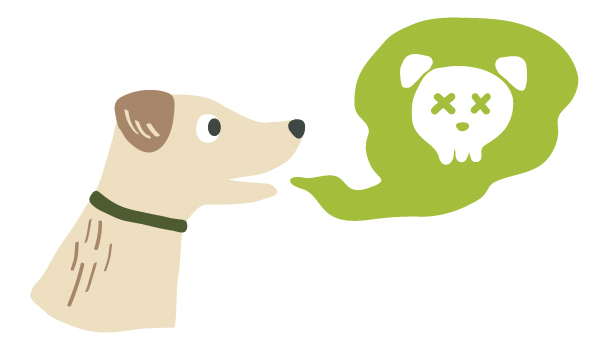 A common occurrence for pets who eat too fast, is regurgitation. This generally occurs when they consume large quantities of food too quickly. In most cases, the food barely reaches the stomach before the large volume of food starts to head back up the esophagus. This type of rapid consumption doesn’t allow your pet’s body to move the food through the digestive system at an appropriate speed. When the food has nowhere to go, it has to back track. They may sound like the same thing, but vomiting and regurgitating are very different. 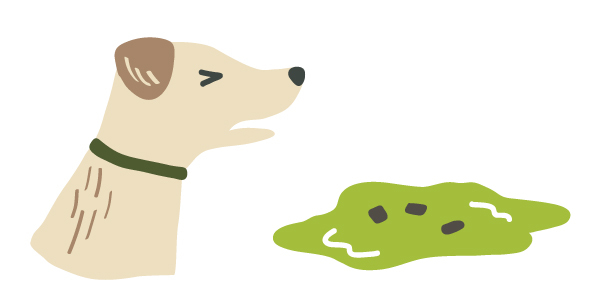 When your pet vomits, they typically struggle to bring up food, bile or other debris from their stomachs. This often looks at least partially broken down, very moist, and sometimes slimy. Generally vomiting occurs as a symptom of an illness or bacteria present in your pet’s system. Regurgitated food rarely makes it past the esophagus, so it will look almost the exact same way it did when they ingested it. Regurgitation is generally quick and effortless for your pet, as that food or debris didn’t have very far to travel. Occasional regurgitation is not usually a concern, but steps should still be taken to prevent overeating. Speed eating isn't the only cause of regurgitation, so it's very important that you speak with your vet if you are not seeing any improvements. Serious conditions can present these symptoms too, so don't take any risks with your pet's health. Infections, parasites, digestive diseases and conditions like Megaesophagus can all cause frequent regurgitation after meals. Recurring regurgitation warrants a vet appointment to rule out life-threatening conditions. How do you slow them down? Fortunately, there are many tricks to help slow your pet down so that they can eat and digest at a healthier pace. There are tons of products and even more DIY solutions that you can try. Slow feeders can significantly reduce the pace at which your pet can eat, and encourages more chewing and better digestion. Even for pets who just prefer to swallow their food whole, 3-5 pieces of kibble are going to break down easier than the mouthful that your pet is probably binge eating right now. Keep in mind that most of these methods work best with kibble or similar textured foods. Although other styles of foods can be used, like canned and raw, they will create a much bigger mess and may not be suitable for all slow feed options. Slow feed bowls come in all shapes and sizes, all with the purpose of helping your pets pace themselves during mealtime. Try to choose the size and style that are best for your pets face shape and food format. Offering a slow feed bowl that is the wrong size or style, may result in your pet becoming frustrated and refusing to eat, or on the contrary, it may defeat the purpose by not being challenging enough. These bowls are not always...well, bowls. There are many styles of slow feeders to elevate the challenge of getting out the food. Most commonly we see dishes that have a raised track pattern or raised pegs that separate portions of food in the bowl, encouraging the pet to use their tongue, and only allowing for a small portion of food to be grabbed at a time. For some pets, this can be frustrating at first, but they should get the hang of it pretty quickly! Another benefit to slow-feed bowls is that they also provide some welcomed mental stimulation for your playful pet! It’s really quite amazing how many ways you can create a slow feed bowl using simple household items. The most basic method is to grab a tennis ball, a rock or even a smaller bowl and place it in your pet’s food bowl. This eliminates the majority of the space that would allow them to grab food by the mouthful. Some sneaky pets will figure out your tricks by simply picking up the object and removing it from their bowls. That’s OK, we’re even sneakier! Simply use non-toxic hot glue or silicone to permanently adhere the object to the bowl, and your pet will have to figure out how to work their way around the obstruction. Contrary to their name, treat balls can be used for more than just snacks. For pets suffering from obesity, a treat ball is a great way to feed a full meal (kibble being the ideal format) and really make them work for their food. This will encourage more mental and physical activity, while still dropping their eating speed significantly. Puzzle toys tend to have more steps than a treat ball, providing even more of a challenge for smart pets. Offering meals or even snacks in a puzzle toy will encourage your pet's problem-solving instincts, allowing them to use their nose and paws to figure out how to reach the food. Depending on your creativity, DIY versions of either treat balls or puzzle toys can be as simple or as complicated as you want. Here are a few for you to try. A really simple method to make your own treat ball is to make a few incisions in a tennis ball and stuff it with kibble. This will be slightly more challenging than a typical treat ball because your pet may have to move the ball a little more aggressively to get the food out. Puzzle toys can actually be quite simple to make too. Grab a muffin tin and put some food in each of the empty cups. This will force your pet to empty each cup separately, limiting the amount of food they can grab at one time. To make a more challenging game out if it, cover each muffin cup with a tennis ball. This way, your pet will have to use their mouth or paws to remove the ball before they can start chowing down on the food. This method is best used with larger dogs. For an option that is a little more cat and small dog-friendly, rinse out a plastic bottle and make 1-3 holes of varying sizes. Try not to make the holes too large; you don’t want the kibble to pour out of the holes too easily! Try to find a square or boxy bottle to increase the difficulty level. Screw the lid back on the bottle and let you pet bat the bottle around to get the food out. This same method can also be applied to a box. Cut some holes in it to allow food to fall out, or for cats, cut large enough holes for them to use their paws to reach the food. Larger boxes will allow for more challenging options. For more interesting DIY options, check out 6 DIY Dog Puzzle Toys. Foraging mats, also called snuffle mats, are a unique way to slow feed your pet. 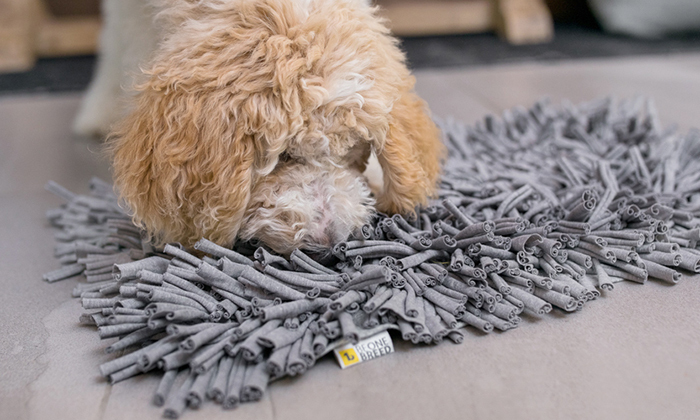 These mats, like the Be One Breed Sniff Out Mat, are typically square or rectangular grated mats, made of plastic or rubber, with thin pieces of fabric tied in between each grate. Pour your pet's kibble right onto the mat and give it a little shimmy to allow the kibble to sink down in between the strips of fabric. Your dog or cat's natural foraging instincts will tell them to head to the mat, nose first, and start foraging for buried treasure. Snuffle mats are actually pretty simple to make, but they are a bit more time consuming than most of our DIY projects. Plastic or rubber pieces of grated mats can be purchased from hardware stores by the square foot, and strips of fabric can be recycled from old t-shirts, towels or socks. Each piece of fabric can be tied in a simple knot around each grate in the mat, and Ta-Da! You’ve got yourself a foraging mat. The closer together or thicker the fabric is, the more challenging the activity will be. To encourage your pet to really dig, try adding a few small pieces of their favourite treats, preferably something with a strong scent to catch their attention. This is the simplest method of slow feeding. Simply spread your pet's food out in a thin layer across a cookie sheet. This will slow them down and is perfect for beginners. Sometimes is it just that simple! Let your pet play with their food and not only will they enjoy themselves, but it will slow them down enough to give their bodies a chance to properly digest. One final way to encourage this is to simply toss your pet’s food directly onto the floor, preferably a clean floor. This will give you a maximum spread and will increase the time that your pet will have to hunt for each piece of kibble. This method may require supervision and some cleanup, so it may not be the best option for you, but it's totally free, and it works for many pets. Many puzzle feeders and slow feed bowls are relatively basic, and your pet is eventually going to figure out the fastest method of getting to their snacks. To keep the excitement fresh, rotate your toys and slow feeders to prevent them from losing their appeal. Your pet will be more excited to “play with their food” when they frequently have new and challenging formats to choose from. To prolong the life of these toys, whether they are store-bought or homemade, is to wash them regularly. All pet foods, including kibble, are oily and oils can go rancid. Keep yourself and your pet safe by routinely disinfecting them. Do have any fun ways to slow your pets down from eating too fast? Let us know in the comments below.